NCG specializes in quick concise illustrations that explain, in a glance, the depth of trauma and recovery your client has gone through. We have a database of thousands of illustrations that we have at our disposal, combined with your client’s photos, x-rays and 3d MRVCTs, your exhibit becomes a custom graphic that will demonstrate your case properly. After nearly 30 years in business we do not have to invent the wheel for every case and our invoice reflects that. 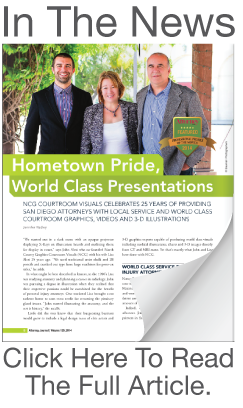 NCG has been a creator of courtroom visuals for 27 years. We are a family operated business handling a wide range of visuals such as medical illustration, charts, and photo reconstruction/manipulation. We offer a complete assessment of what type of exhibits will work for your case along with a winning finished product. In typical Personal Injury cases we summarized and categorized all the medical reports for the use of descriptive terms and formulating the best layout with the best impact visually. At NCG we specialize in incorporating CTs and MRls into 3-D images that demonstrate your client’s injuries and legitimize the basis of our illustrations. One of the advantages of a small company is you can count on excellent personal service. No matter where you are in the U.S., we stay connected. So whatever the case, NCG can produce cutting edge visuals that best represents your client. Call NCG Courtroom Visuals legal design team for all your trial exhibit and medical illustration needs.